Our Patron Saints – Ordo Militaris, Inc. 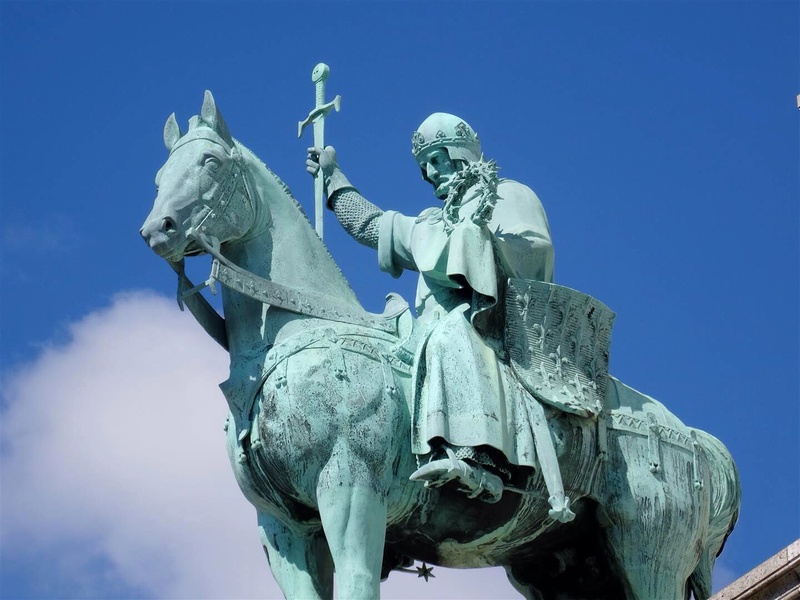 Blessed Charles the Good (1082 – March 2, 1187 A. D.), a Dane. Born a prince, the son of King Saint Canute of Denmark and Adela of Flanders. After his father‘s murder, he was raised in the court of his maternal grandfather, Robert de Frison, Count of Flanders (part of modern Belgium). Fought in the Second Crusade. 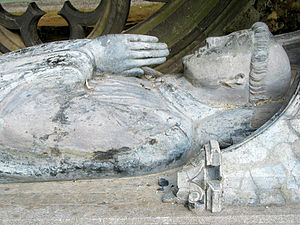 Succeeded Robert II as count of Flanders in 1119. Married into the family of the Duke of Clermont (in modern France). His rule was a continuous defense of the poor against profiteers of his time, both clerical and lay. Called the Good by popular acclamation. Reformed laws to make them more fair, supported the poor, fed the hungry, walked barefoot to Mass each day. 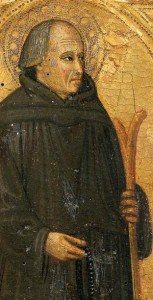 Martyred in the church of Saint Donatian of Rheims at Bruges by Borchard, part of a conspiracy of the rich whom he had offended. His relics are kept at the Cathedral of St. Savior, at Bruges, Beglium. Feast Day: March 2nd. Saint Matthew of Beauvais (died 1098 A.D.), a Frenchman, who participated in the First Crusade as a Knight. Captured by Saracens, he was ordered to renounce Christianity; he refused and so was beheaded, as a Martyr. Feast Day: March 27th. Saint Arnold of Hiltensweiler (died after 1127 A.D.), German, Married with family. As a Knight, he participated and fought in the First Crusade. Founded a monastery at Langnan, Germany c.1122 A.D. Feast Day: May 1st. Blessed Gerard of Villamagna (1174 – 1242 A. D.), Italian Crusader, was Esquire to a knight. 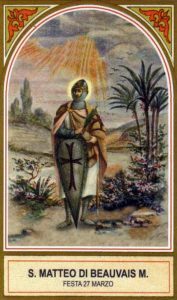 As a Crusader he was captured, later ransomed, and then returned to Italy. Franciscan tertiary (SFO). Lived the rest of his life as a hermit noted for his piety. Feast Day: May 13th. 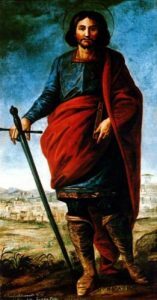 Saint Nicasius Camuto of Jerusalem (1135 – 1187 A. D.), a Sicilian, Member of the Knights Hospitaller & Crusader. Fought in the defense of Acre. Captured by Saracens. They ordered him to renounce Christianity and convert to Islam; he refused and so was Martyred by being beheaded. He is patron of Caccamo, Italy. Feast Day: July 1st. 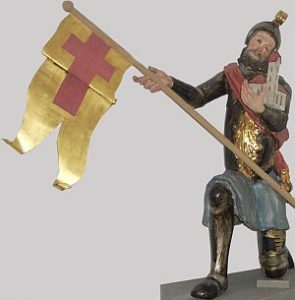 Saint Gobert of Aspremont (c. 1187 – 1263 A.D.), Frenchman, who served as a Crusader both against the Albigensian Heretics in Southern France, and with the Holy Roman Emperor Frederick II, on the Sixth Crusade. Afterwards, he returned to France and became a Cistercian Monk in 1237, and lived for a time as a Hermit in Picardy. His relics are buried at Villers-en-Brabant, in France. Feast Day: August 20th. Saint Louis IX (25 April 1214 – 25 August 1270 A.D.), King of France & Franciscan Tertiary. Led the Seventh and Eighth Crusades, first in Egypt, then in Tunisia. Only French Monarch to be canonized. Considered his duty to lead Christians in Crusade to be greater than that of ruling his Kingdom. Died of dysentery on the 8th Crusade. His relics are conserved at St. Denis. Feast Day: August 25th. 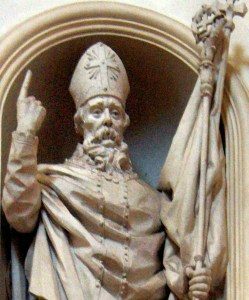 Saint Bonifilius of Foligno (1040 – 1125 A. D.), Italian, born at Osimo. Was a Benedictine Monk and Abbot, popular preacher. As Abbot assisted on the First Crusade as a Military Chaplain from 1096 to 1104 A. D., and returned home safely. Feast Day: September 28th. Saint Francis of Assisi (1182 – 1226 A. D.), Italian, patron of Italy & Founder of the Friars Minor, popularly know as the Franciscans. Prophetically foretold the outcome of the Crusaders’ battle with the Sultan of Egypt, Al-Malik al-Kamil. 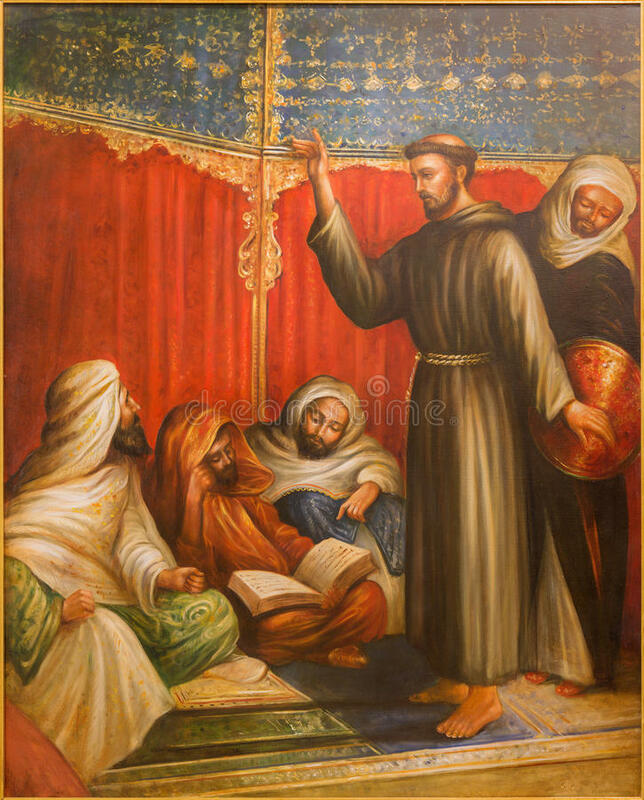 Courageously crossed enemy lies to preach the Gospel to the Sultan, for whom he obtained the grace of conversion on his deathbed. 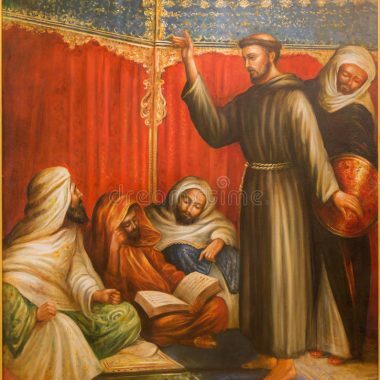 Famously remembered by the Muslims in Egypt as the Christian Sufi who debated with the Imams of the Sultan. Returned home safely. Received the Stigmata of Our Lord Jesus Christ, on Sept. 14, 1224 A.D. Feast Day: October 4th. Blessed Gilbert of Neufontaines (died June 5, 1152), French Nobleman, from Aquitaine. Married to Petronilla, father of Pontia. Fought in the Second Crusade with King Louis VII from 1146 to 1149. When he returned home he convinced his wife and family to let him follow a call to religious life. Hermit and Premonstratensian monk. 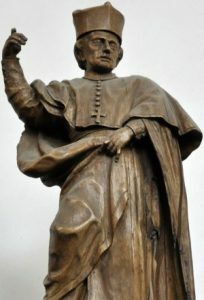 Founder and abbot of the their monastery at Neufontaines, France, which was noted for its hospital where Gilbert cared for the sick. Feast Day: October 24th. Saint Leonard of Reresby (13th century) Englishman from Yorkshire, was miraculously freed after being captured by the Saracens, safely returned home to England. Feast Day: November 6th.